At Sea Team®, storage bins aren't just generic white plastic bins with a lid anymore. Add a personal touch to your décor with unique storage options - use a set of baskets to store odds and ends on shelves, or try colored, foldable fabric laundry hampers in the living room. All of our baskets are made of fabric like cotton, canvas, linen, jute and burlap. They are sturdy, reusable and recyclable. 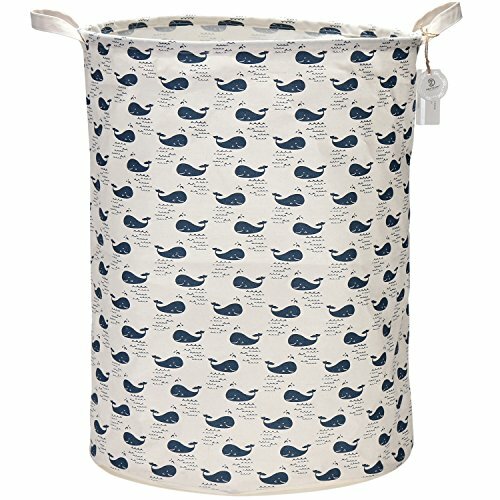 From a small basket to a large laundry hamper, storage bins can be a beautiful and functional accent to any room. NATURAL MATERIAL: 100% Linen & Cotton Fabric + PE Coating Lining. EASY TO USE: No assembly and tools required, easy to use; Collapsible design is convenient for saving your living space. STYLISH LOOK: Cute printed pattern is specially designed for kids, which combines both of the ornamental and practical forms. They are not only household life good helpers but also charming decorations in kid's room. NOTE: The laundry hamper comes with compression packing which may result in crumpled in long-distance transit. The hamper will recover after a period of time and also can be smoothed out by steam iron and hairdryer.